4:1-13 Satan tests Jesus in the wilderness. 4:14-15 Jesus begins his public ministry in Galilee. 4:16-30 Jesus preaches in His hometown of Nazareth and they try to kill Him. 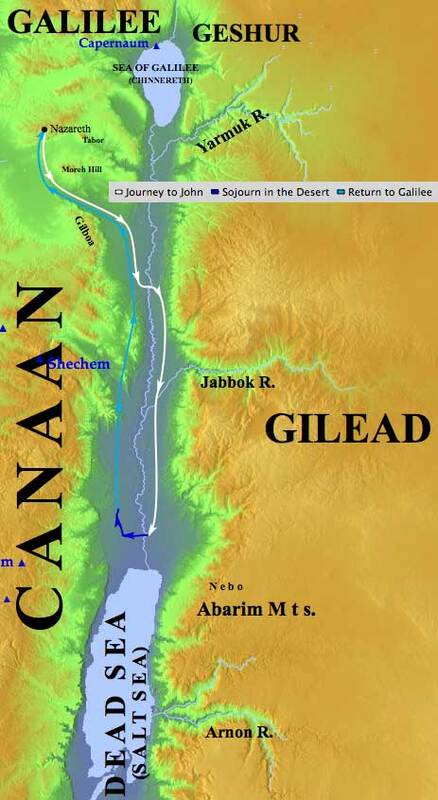 4:31-32 Jesus settles in Capernaum. 4:33-37 Jesus casts out a demon in Capernaum. 4:38-41 Jesus heals Simon Peter’s mother-in-law. 4:42-44 Jesus preaches in other cities, and in Judea. — The Apostle Peter was married, Jesus healed his mother-in-law (Luke 4:38-39, 1 Cor 9:5). — The writer of Hebrews mentions twice that Jesus was subject to temptation like any other man, but did not yield to it (Hebrews 2:18, 4:15). — Immediately after Jesus was baptized in the Holy Spirit, the enemy came to wreck His life. Even today, after something great happens, the enemy will come to take it away by getting you to compromise. - The lust of the flesh: Eve “The tree was good for food” (Gen 3:6). Jesus had not eaten in 40 days and He was hungry (Luke 4:2) when the devil asked Him to turn the stones into bread. - The lust of the eyes: Eve saw that “It was pleasant to the eyes” (Gen 3:6). The devil took Jesus to a high place and showed Him “all the kingdoms of the world in a moment of time” (Luke 4:5), and said all this can be yours if you bow down and worship me. To worship the devil is simply to obey him. — It is not a sin to be tempted. Jesus was tempted without sinning. The enemy will plant a thought in your mind and then accuse you of being bad. We need to understand the tactics of the enemy. The devil is a liar, and that is what He does (John 8:44). — Temptation is bait and always looks good or it would not be tempting, but there is a hook hidden inside of it. — Temptation is designed to destroy your life mission. Jesus had been “anointed” and “sent” (Luke 4:18). The devil was trying to end this ministry before it even began. You are tempted the worst when the devil sees something beautiful and powerful in your future. The goal is to end it now before it even begins. A cheap thrill can take away your life’s mission. Esau sold his birthright for a bowl of soup (Gen 25:32, Heb 12:16). How many times is he successful in our lives? — We are to flee from temptation ( 2 Tim 2:22) much like Joseph fled from Potiphar’s wife leaving his coat behind him (Gen 39:12). God will always provide a way out to escape temptation (1 Cor 10:13). The bait is whatever appeals to us and we are baited and drawn away by our own desires, lusts and passions (James 1:14). — The enemy wants you so bound by your past that you are of no use, or so caught up in the drama and busyness of your life that you have no time to spend with God. We need a healthy balance. — Even if you have messed up many times in the past, it is never too late to get started: “For the gifts and the calling of God are irrevocable.” (Romans 11:29 ESV). The same destiny awaits you, though the time that you spend enjoying cheap thrills subtract from the time of enjoying your true destiny. — Jesus was not understood by those that knew Him in His hometown, it is highly doubtful that you will be. Your geographical location can determine your effectiveness. — Jesus cast out demons and the people all marveled and said “what new teaching is this?” (Mark 1:27). Fast forward 2,000 years till today and when God delivers someone, people still say “what new teaching is this?” They like to stay hidden. — Jesus often withdrew to solitary places where He could spend time alone with the Father (Luke 4:42). 1. Jesus was led by the Holy Spirit into the wilderness for forty days. What are your thoughts on God’s purpose(s) for this time? 2. During His time in the wilderness, Jesus fasted. Why do you believe He did this? 3. At the end of the forty days, the devil tempted Jesus with three questions. Why do you think those particular questions were asked? What can we learn from the answers Jesus provided? 4. Before His time in the wilderness, Jesus was “full of the Holy Spirit”. After the forty days, He returned in “the power of the Spirit”. What does this mean to you? 5. Why do you think Jesus could not do anything for the people of Nazareth? 6. Why do you think the Nazarenes become so angry? 7. When the demons He drove out acknowledged Jesus as the Son of God, He would rebuke them and cause them to be silent. Why do you think He did this? Please leave your feedback in the comments below. Remember that we are testing this out and whether we continue will be determined by the participation! We want to put our time where it matters the most. Sylvia Todd Thank you, Nell, blessings to you :)! Ann Hoggarth Thank you for starting this Bible Study! I have been trying to join one but they have all been on a week day and I have to work. I feel very blessed that God led me to your site and I can now learn the Bible. Your outline is amazing! It really helps me understand the Word of God. I pray that this study will continue to grow and help others learn and Praise the Lord for all that He has done for us. Sylvia Todd Hi Ann :)! You can chime in at any point from Monday to Monday, or really even after that, 'cause we're not taking it down. It's just that by the next Monday we'll have posted a new one :). Kay Rushin I have been reading and studying these lessons, all the questions are thought provoking, but what stands out in my mind. If Jesus was tempted, why in the world woulded we think we will be tempted? And why do we let the devil have so much power over us? God has clearly given us all the power we need, when are we gonna start using it? Just a thought in my mind for me to ponder. The power of the spirit does live within us, does it not? Be encouraged! Cathy Card I think Gods purpose was to show the power of the holy spirit and what it can do under temptation , Jesus was filled with the spirit and believed in the Holy Spirit therefore no temptation would let him falter. Daryl Donerson Q1-Being fully human(in the flesh) Jesus needed to be tested for obedience and Jesus needed to understand what we go through when tempted. Deng Tembreza Temptations are everywhere. Just for my thoughts that when temptations come and I fall into it I just pray pray and pray to our LORD JESUS CHRIST that HE brings me out of it and forgive me.For just knowing and believing in JESUS CHRIST as our LORD makes me feel forgiven and gives me peace in my heart. San Juanita Sanchez I've never had bible study, and I'm loving it every step of the way, Thank you Pastor Dion! GOD BLESS YOU! Deleted Member I believe the fasting was done to show us sometimes we have to fast to over come something that is tempting us or just to have a closer walk with Jesus. Satan tried to make Jesus turned the stone into bread for see if He would eat it, because at that time Jesus was in human form and he had been fasting for 40 days and was hungry just like we would be. And satan tried to tell Jesus if he would do so and so , He would give Him all the things He could see. But what's so cool to me, none of that stuff belong to satan anyway. It all belonged to God. Jesus passed the ultimate tests in human form to show us we too could pass the tests if we trust in God. Angela Flowers-Jones 1. So He (Jesus) can hear from God. Some things require fasting and praying be still and know I am God Also to allow Him (Jesus) to focus on God. 2. To demonstrate faith and totally depend on God!!! 3. The first question was to test His human nature (to eat) Second question to test the human nature for man desires for accomplishments. Third to test His faith and belief and the power of what He (Jesus) believes. 4. He was baptize(Holy Spirit), He experience the accepting of Christ. After the wilderness,(the power of the Spirit). He experience the faith to operate in the power of God The Father. Angela Flowers-Jones 5. Because of the perception of what they perceive Joseph to be. They didn't have faith and didn't believe who He was. 6. Because He(Jesus) said no. He didn't not operate in the power He knew He had because He knew they wouldn't believe. 7. He didn't want a testimony from them. They aren't in control. If the demons can recognize Him then we should be able to. It also shows the power of who He is for us as followers. Margaret Ponchel Jesus was driven to the desert by the Holy Spirit to enable Him to focus on His relationship with the Father...no distractions, just quality time to prepare for His mission. KathyMaria Badalamenti The people of Nazareth did not believe that Jesus was Divine because they just thought of him as Joseph and Mary's boy and there hearts were closed to the idea that He was the promised one of God. Many teachers in our day would like us to believe that Jesus was just another teacher, but I am grateful that God has revealed to me and many others that Jesus is the son of God, The promised redeemer and the living, risen one. Who sits at the right hand of the Father in Heaven and who is coming again to receive us who believe. Lorna Smetak Jesus went into the wilderness to prepared and purified to what was laid ahead in his journey. He was lead into the wilderness by the Holy Spirit and once there he was a mere man/human, and relied on his fathers will to help him through the temptations of Satan. We find ourselves with the holy spirit (full of joy) and we think that we are invisible because we read the bible every day and we think that it makes us invisible. But Satan always has a plan to disrupt or steal our joy and turn it into sorrow and weakness. We must remember that we will always have the strength holy spirit - the Lord to help us through trials and tribulations. Jesus could not do anything in Nazareth? I think that they were actually jealous of what was said, how someone other than God could heal others. It also was mentioned that he must go to Israel and other areas to heal people and preach the gospel to others. Rebuking the demons not to say anything was because it was not the time for anyone to know who Jesus actually was. Karen Fletcher Thank you so much for the valuable time you are putting into these studies. Please keep them going. I am sure there are many such as myself who are enjoying and benefiting from them but not putting in comments. I love the extra notes, maps, and especially the old and new testament connections. Your time is not wasted. Karen Fletcher Right on! The devil only has the power over us that we give him. I remember when I first realized this. It was a life changer. Carol Pady Jesus was tested to show His Father that He would be worthy of becoming the Savior and by resisting sin and temptation , it made Him the innocent lamb who was slain for many. I believe that Jesus fasted to draw Himself nearer to God. He knew God would give Him the strength to prevail over Satan. Satan asked questions that he himself had suffered temptation from, for he desired to be as great as God. Jesus was not tempted by them because Jesus put God above everything. It was God's will that Jesus sought after not His will. Jesus was refreshed and His Spirit emboldened by His resisting temptation and His fasting. Jesus could not lift the scales from the eyes of the Nazarines because they knew Him as Joseph the carpenter's son. They were angry when He rebuked them by saying no prophet is welcome in his hometown. He rebuked the demons and would not let them bear witness to Him, because His time had not yet come. He was in perfect oneness with God and knew that the time for His crucifixion was appointed by God. He did nothing to hasten it or interfere with God's timing. He was always obedient to His Father. Dan Cordosi Satan had no control over Jesus HIS focus was not of this world, but from above. Cinnamon Gilmore I think he wanted to show us that we can do nothing in our own power with out the Father, and also that it is possible to resist the devil and have him flee. Rose Sicilia (1) to prepare Jesus for his purpose of being sent by the Father to fulfill the scriptures and save mankind. (2) fasting was a cleansing of mind and body to prepare Jesus and be close to The Father. (3) devil plays on weakness and he knew who Jesus was. Being hungry after 40 days tempting Jesus to turn stone into bread showing Jesus the world if He would bow down and obey him and finally since satin was a fallen angel quoted scripture to Jesus to throw himself down and the angels would save Him this would defeat God's plan for Jesus and mankind Jesus returned each time with scripture making satin leave. (4) Full of Spirit is knowing it's inside you guiding and helping Power of the Holy Spirit gave Jesus access to comfort healing and raising of the dead. (5) in his home town people knew Jesus as son of Joseph the carpenter they did not believe nor had seen or heard Jesus during His ministry unbelief. (6) they were angry that if this was Jesus why did he never heal the sick from his own home town again disbelief. (7) the demons knew Jesus was the Son Of God and this was not the time for that to be revealed to people. It was God's plan Jesus was to follow not satin or his demons. Diane Symborski✝ Pastor Dion, I spend a lot of time a lone and all I do is read devotions, the word and Sara Young books. I have many books about the Holy Spirit that I have read and will read again. It helps me threw what I have to get threw. When I get threw all, I will give God all the glory. God has been by my side threw over four years of problems really 30. He's not going to let me go now. He has some big plan for me. I don't know what it is but I know I didn't suffer threw all I have and come this far for my Father to let me go. I'm in it for the long run 30 years was the first thing I got threw. Then 2.5 years for the one after that. I'm now going threw it again and i'm hanging in there i'm half way threw. I just keep my mind busy with the word of God. God saved me from some ugly things. My Father loves me and He will not let anything happen i'm almost to the finish line. The darkest hour is before dawn. My christian therapist has me write things down and place them all over to read to let me know I came along way keep on going. I try to keep to myself a lot because I can't break. My mind is moving right along with what I have to do. Jesus, I pray the blood of Jesus over me, over my doors and windows. My house is blessed and Jesus lets me know. I have seen to many signs and they are signs fron God. That cross in the trees we found last summer looking right out from our porch didn't just happen like that. That's Gods glory and he's letting me know i'm safe keep going you've done so much and so far God is still beside me. In Jesus Name I Pray. Amen! Father, I Love You and Thank You. I give You all the praise and glory. Amen!!! Kyra Beam I love this Bible study and everything you do. Daryl Donerson Q2- I believe these questions were asked because they focus on self and not fully on GOD. We can learn from Jesus answers that it is very important in our lives with God, to Daily Learn, Know, and Obey God's Word. Diane Symborski✝ We all need the Holy Spirit in us. Why? Because Jesus, gave the Holy Spirit up for all who believes. When Jesus, was on the cross they put vinegar to his lips. He then bowed his head and said. "It Is Finished" He then gave up his Spirit for us. The Holy Spirit is our comforter. But if you want to get to the Father. Remember nobody gets to the Father accept threw the Son. I pray the Holy Spirit over each and everyone on here. With out believing in the Holy Spirit you have no faith. You also need to know Jesus is the Son of God. Jesus died for our sins on the cross. The Father rose him on the third day. These are words we need to know. Jesus, has risen thank You Father God-♡ The Holy Spirit is a big part of a Christians life. Amen and Amen♡ God Bless You All! Kathy Banfield I goofed at the beginning of this Study! I hope it's not too late to update my reply! Regarding Mary--well, she was born sinless, unlike anyone else except Adam and Eve. When she found out she was to become a mother, her thoughts were more like, "HOW can this happen?" THAT is why she questioned God! She was a virgin, but knew about the birds and the bees. So, how could she possibly conceive? OK, that's my statement--LOL I apologize for falling behind; I have two Bible studies here in NJ and I'm a bit overwhelmed! But I sure have a LOT to learn and to think about! Kathy Banfield Fasting: Part of the OT Mosaic discipline that Jesus adhered to. Kathy Banfield Jesus was better prepared for Satan than that stupid, conniving devil realized! For Jesus was able to accurately quote Scripture in rebuke to Satan's demands.Every thing satan threw at Him, He retorted with intelligence and accuracy.Just think, though, how exhausted Jesus must have been after THAT confrontation! He was tired and hungry to begin with.Now, isn't that always the case--Satan tries to tempt us when we're at our weakest point? He is such a jerk! Kathy Banfield After 40 years of suffering from an eating disorder, I sure can relate to Jesus' plight! I really believe that if we hold out, never lose faith, accept Jesus, we will be rewarded TENFOLD! Kathy Banfield Jesus could not do anything in Nazareth because Scriptures say a "prophet is not welcomed in his own town." HOW TRUE! Kathy Banfield The people of Nazareth were mad because they did not believe Jesus, thought HE was possessed by Satan, and everything He said insulted them. They were idiots, and Jesus removed that veil of their hypocrisy.When Jesus took care of the demons, He made them shut up because, for one thing, they were STUPID! They really did not possess (no pun intended) much smarts. So, Jesus silenced them. And they listened because He is the Son of God! He probably could have instructed them to flee into a herd of pigs over and over again! Cheryl Hebert Discussion Questions: 1. Jesus was led by the Holy Spirit into the wilderness for forty days. What are your thoughts on God’s purpose(s) for this time? 2. During His time in the wilderness, Jesus fasted. Why do you believe He did this? 3. At the end of the forty days, the devil tempted Jesus with three questions. Why do you think those particular questions were asked? What can we learn from the answers Jesus provided? 4. Before His time in the wilderness, Jesus was “full of the Holy Spirit”. After the forty days, He returned in “the power of the Spirit”. What does this mean to you? 5. Why do you think Jesus could not do anything for the people of Nazareth ? 6. Why do you think the Nazarenes become so angry? 7. When the demons He drove out acknowledged Jesus as the Son of God, He would rebuke them and cause them to be silent. Why do you think He did this? MY ANSWERS: 1) To prove HIS prophecy and Word---HE was sinless and never submitted to temptation. However, HE wants us to know he was tempted and so will we be. God’s Word says when we are tempted, HE will provide a way out! 2) I believe HE fasted so that the flesh would HAVE to lean on the FATHER. That is the purpose of fasting, as I understand it, anyways! 3) The devil gave it his best shot and failed; the answers JESUS gave defeated satan right away. IT IS WRITTEN – our tool to defeating satan, also! 4) The Holy Spirit is our weapon of power! HE, after all, was given to us for the leading, guiding and truths HE would give us to work the Gospel in this world. HIS POWER HAS TO BE WORKING BY HIS ANOINTING IN OUR LIVES, TOO! 5) Their disbelief! No prophet is accepted in his own town. 6) They could not understand how Joseph’s the carpenter’s son could be making these claims. 7) Because HIS time had not come yet. And every time the Jews got a glimpse or heard of what HE had done, they sought to kill him. I think HE wanted those he knew HE would heal to believe on their own that HE, indeed, was their Messiah, the Son of God. When the time was right, however, He made HIS identity clear and then they crucified HIM! Cheryl Hebert Pastor Dion, I sent this Bible Study via email to my children and grandchildren..I hope they check the site out, but mainly read and study your material. You are a true blessing to me in helping me to understand the Word better!! Cheryl Hebert No where in the Bible does it say Mary was sinless..it says she was blessed! Lucille Jordan Jesus was fasting and praying in order to prepare for what was to come. Satan tempted Him with things that would appeal to man but every temptation that was put in his way Jesus came back with the word..."Ït is written"
Paul f Please include the audio version for me. I had two catarac surgrys in both eyes. I can see yet not read really well. I read and listened to Luke chapter 4 and it was neat. I cannot recall much of it. I have really low blood sugar level and today they have dropped off a lot. Was hard for me to reall which way to come on home. I could not find the place that I was heading to. I did enjoy lLucke ok though. Sylvia Todd The belief about Mary being sinless is part of the Catholic doctrine, which Dion and I don't follow either, but of course those of the Catholic faith believe in Jesus too, and are welcome here :). Sylvia Todd Thank you all so much for the great feedback and insights this week! It has truly been a blessing :). Sylvia Todd Yes, there is nothing like a good fast to clear out baggage that is weighing a person down and to bring clarity and strength. Sylvia Todd Amen, sadly there are some Christians who will talk more about the works of the enemy than the works of the Christ. Sylvia Todd Right on, Cathy, even Jesus wasn't expected to do it alone; He needed the Holy Spirit with Him. Sylvia Todd Yes, Daryl, I think there's probably a certain of empathy, and also of taking over the place of Adam. Jesus was human just as Adam was and could still overcome temptation. Sylvia Todd Amen, Daryl, if we can go without the most basic needs like that, there isn't much we can't overcome! Sylvia Todd Amen, we cannot do it alone, and are not expected to! Sylvia Todd We're glad you have been blessed, Juanita! Sylvia Todd Yes, the enemy likes to try to get to us where we are weak, but we have all we need to get past that! Sylvia Todd Amen, thank you for your thoughts, Angela! I agree those particular questions were intentional and probably touch on great weaknesses of mankind in general. Sylvia Todd I've never heard it put that way, Wendy, makes sense! Sylvia Todd Amen, Kathy, it's difficult when people are to familiar. I think many of us who have non-believers in our family have encountered the problem Jesus did. Sylvia Todd Amen, JD, thank you for your thoughts! Sylvia Todd Agreed, Lorna, that's a big mistake to think that we are not seen by the enemy and to be less than vigilant, though there is of course, no reason to be afraid. The people in His hometown probably were jealous, probably making comments that He was stepping above His station...yikes! Sylvia Todd Thank you very much for your encouragement, Karen. Dion puts a lot of time into creating worthwhile content for it :). Sylvia Todd I pray that the Lord will continue to heal you, Paul, and allow you to serve Him in strength! Sylvia Todd Amen, I don't think we have words in our language to describe how much He loves us! Sylvia Todd Cheryl, so sorry your answers got cut off! It's ok if you don't post the questions, maybe just the number? Plus, you might post your answers 1-2 at a time if they are very long. May the Lord bless you! Sylvia Todd Thank you so much for your great thoughts, Carol! Yes, I believe that is much of what brought Jesus through it, the fact that He absolutely wished to follow God's will. With the support of the Holy Spirit, He had the strength to do just that. Sylvia Todd Yes, amen, He leaned on the word of His Father. Sylvia Todd Amen, thank you for your thoughts, Rose! I know that with all that Jesus had to contend with, great preparation was needed and the Father would be sure His Son was adequately prepared. Deleted Member Amen, when satan tries to tempt us or put us through a trial, just say talk to Jesus, satan, because it is written. Sylvia Todd You will make it through your struggles, Diane, may the Holy Spirit guide you and comfort you each day! Sylvia Todd We are glad to know you are blessed by the study, Amber! Sylvia Todd Yes, I believe that is the case as well, they were all temptations to put self above God. Sylvia Todd Haha, yes, there are definitely a lot of 40s there! Sylvia Todd I know that after fasting that long He probably wasn't at His physical best, so I guess Satan though he could kick Him while He was down...little did he know! Dion Todd I pray that the Lord will restore your body and level out your sugar, may your eyes grow stronger each day in the name of Jesus. Brandon Coker The beginning of Luke 4 jumps out and tells us "Jesus was FULL of the Holy Spirit and was LED BY THE SPIRIT INTO THE WILDERNESS. wE need to be filled first by the holy spirit, and then as we are tested, we are strengthened. When I find myself tempted, I remember his words, "Be holy, for I am holy" and then the temptation passes. Remember to ask Jesus into our hearts and we will be filled with the Holy Spirit. If we don't, we fall into all kinds of evils the world offers. Daryl Donerson Q4- This means to me that Jesus had The Holy Spirit in him after being baptized, not until he fasted, prayed, and went through the temptations in the wilderness, then he received the Power of The Holy Spirit and was ready for his Ministry. Daryl Donerson Q5- Jesus could not do anything for them because they knew and saw Jesus grow up as only being the son of Joseph and Mary. Because of this they couldn't receive the fact that he was sent by God ,to save the world from their sins. I believe it's just like me going back to the neighborhood I grew up in and preach God's Word. It would be hard for them to accept it because they knew the person I used to be. Daryl Donerson Q6- They were angry with Jesus because he was saying that they were just like their ancestors of Israel, wicked and not believing the prophets that God had sent just like Jesus. Deleted Member Amen, God's Word is going out over the land. Praise Him. Deleted Member Great words. Thank you. Deleted Member Amen, hold on and have the faith and He will see you though. Deleted Member Amen, Thank You Jesus. Deleted Member Prayers being sent for you. Hang on, Jesus will bring you through. Praise Him in the storms. God bless you. Deleted Member Yes, through God the impossible, can be made possible. God is good all the time, All the time God is good. Deleted Member Thank you Pastor Dion and Sylvia for all your hard work. Love y'all. Jeanie White I think Satan underestimated Jesus. He tempted him with things that a mere mortal would desire. Jesus was man and God. Satan thought he could influence him the way he did Adam and Eve. Thank you Jesus for being so strong and godly! Wish I could be so strong and keep my eye on the true prize everyday instead of being so distracted.i am learning so much.Thank you! Daryl Donerson Happy Mother's Day to all the Mothers I Pray that you will have a Blessed and Joyful Day God Bless You All!!!!!!!!!! Sylvia Todd Thank you, Daryl, you as well :)! Daryl Donerson Q7-It seems to me that Jesus did not want the people to know that he was God in the flesh, but only that he was sent by God to preach The Kingdom of God. Daryl Donerson Thank You Pastor Dion I will Pray that God will continue to give you the Strength, Wisdom, and Knowledge to do the work that He has put before you. God Bless!!!!! Roseanne Braverman Questions 2 & 4 I was always taught that fasting makes room for the Holy Spirit. While Jesus was aleady 'full' of the Holy Spirit, after 40 days of prayer and fasting the Holy Spirit became a 'power' in Jesus, enabling Him to take on the tempations of the devil and empowering Him to preach and heal. Yvette Cantrell 1- to set Jesus apart - fasting, praying and to strengthen Himself for The Mission. 2- I understand fasting is to be done in expectation of God's intervention and provision. 3- those areas are the weakest of human nature. Those are the areas that humans are quick to give in to. However, he apparently did Not comprehend Jesus as God in the flesh... NO WIN enemy!!!!! 4- the persae, test was fulfilled. Now what into the divinity of The Will of God. 5- if the world does not accept The Truth, dust your feet Off - Next. God will NOT force Himself on us. 6- Their finite minds could phantom the Fullness of God (Spirit/Flesh)! 7- this one I am not certain of... help? Sylvia Todd Amen, it's always good to keep an eye on the big picture :).